Microsoft shipped build 14291 of Windows 10 to the Fast Ring insider channel a few hours ago, and with it an update for the system's default browser Microsoft Edge that introduces initial support for extensions. The version of Microsoft Edge that is available on stable builds of Windows 10, does not support extensions currently but Microsoft plans to change that this year by integrating an extensions engine to Edge that is very similar to that of Google Chrome. 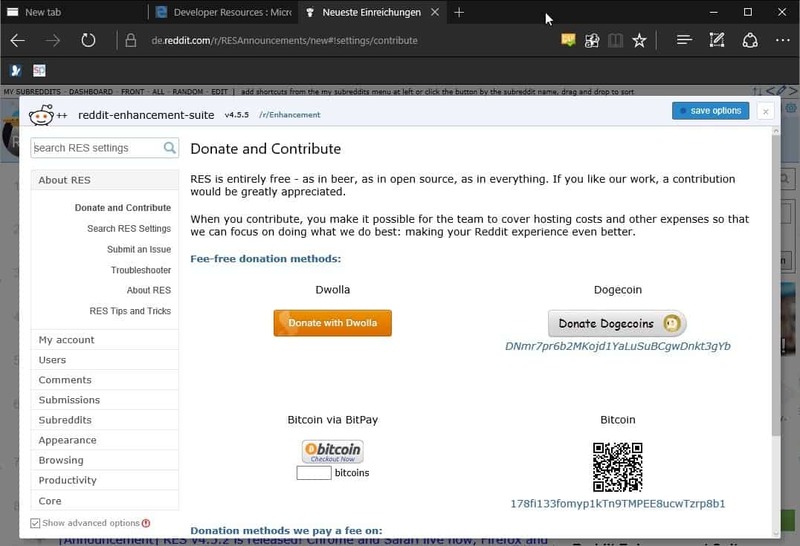 The benefit of the approach is that it is easy enough to port Chrome extensions to Microsoft Edge (and vice versa), the downside that extensions, at least in their proposed state, won't be as powerful as Firefox's (Mozilla moves to WebExtensions as well). Insider Builds are preview builds that are tested by developers and tech enthusiasts, and support for extensions in Microsoft Edge shows why Microsoft decided to ship a preview first. 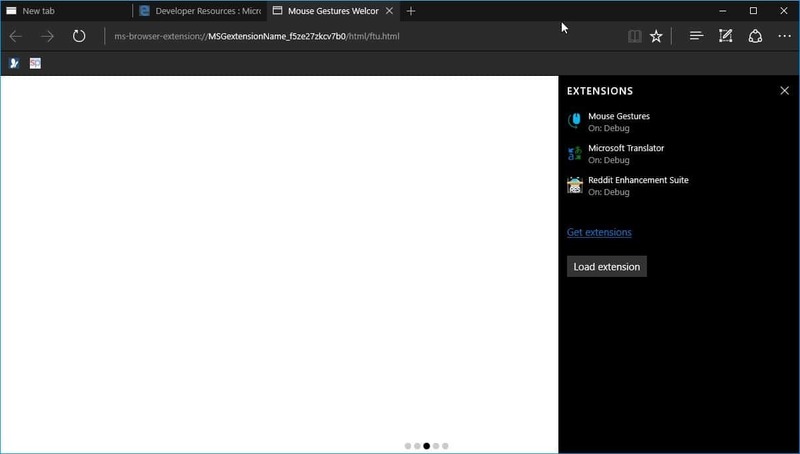 While Edge supports extensions in build 14291, the implementation is not final which shows when you begin the process of installing one of the three extensions made available by Microsoft. Instead of downloading extensions from Windows Store, where Microsoft plans to offer them once they launch in stable versions of Windows, they are sideloaded currently. Initially our Insiders will download and then sideload extensions for testing purposes, but ultimately we will make extensions available to all of our customers via the Windows Store to ensure the quality of the end-to-end experience. Click on the three dots in the upper right corner of the Microsoft Edge window and select Extensions from the menu that opens. Click on the "Get Extensions" link. This opens a preview page on Microsoft's Windows website listing all extensions currently available for the preview release. Click on download to download these to your local system. The extensions are provided as .exe files currently. You need to run them individually which extracts them to the local system and displays a readme file with instructions. Once extracted, select Extensions > Load Extensions in Microsoft Edge and pick the folder they have been extracted to, to sideload them in the browser. Microsoft ships the Insider build with three extensions: Microsoft Translator, Mouse Gesture, and Reddit Enhancement Suite. 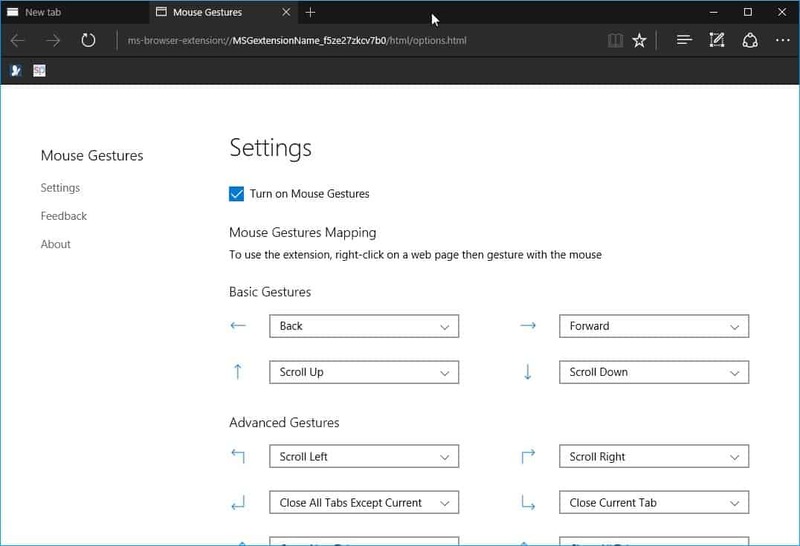 Mouse Gestures adds an icon to the main menu of Microsoft Edge which you can click on to open the settings provided by the extension but not remove. To use the Mouse Gestures extension, simply right-click on a web page and start to draw to run commands such as back, forward, or close current tab. Reddit Enhancement Suite works for the most part like the extension for other browsers. It improves the experience on Reddit by adding functionality and customization options to the site. Microsoft Translator adds an icon to the address bar of Microsoft Edge that you can click on to translate the page into the default language. It ships without options currently which means that you cannot change the target language or make other modifications currently. 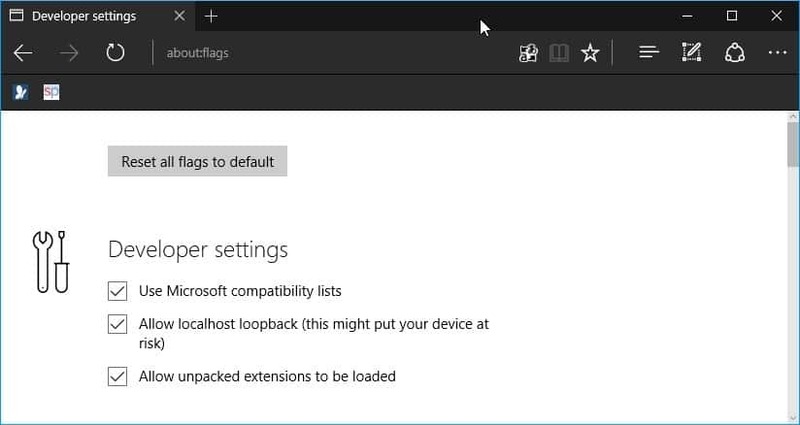 A new Developer Setting has been added to the most recent version of Edge that defines whether unpacked extensions can be loaded in Edge. Load about:flags in the Microsoft Edge web browser. Under "Developer Settings", check or uncheck "allow unpacked extensions to be loaded". Microsoft promises that partners are already working on bringing extensions such as Adblock Plus, Amazon, LastPass or Evernote to Microsoft Edge later in 2016. Documentation is now available including an API reference, a developer guide and more on the Microsoft Edge platform site. The Windows 10 Insider Build 14291 update brings initial extensions support to Microsoft Edge, the default system browser on machines running the operating system. is this the only thing I need to do to get into fast ring ? Yes I think it is, but it may take a while before builds become available. Check for updates regularly using Windows Update. …and why trails in the first place ?! Too little, too late. Nobody should care about Edge any more. Move on to Opera, Firefox, Chrome and dump the Microsoft browsers. yeah! screw any new innovation or competition! Let’s even drop Firefox and Opera, and all browsers and just have Chrome. Then we can live the great life like it was when we had only IE6! If Microsoft had not screwed and trampled its competitors, we might have the latest version of Netscape. I wonder how good that would be? MS deliberately made Windows incompatible with Netscape because it was far superior to anything MS had. Still, Netscape screwed MS for a few hundred million dollars in anti-trust compensation. 1. Microsoft utilized Windows to allow deeper integration with Internet Explorer (with IE4). Netscape still worked just fine, but Microsoft had the advantage there. 2. Microsoft was able to release IE4 w/ Windows 98 during a huge PC growth period allowing people to have a default browser. This heavily benefited with Microsoft’s “monopolistic” advantage. 3. Netscape used to cost money, IE was free. 4. Netscape’s development was greatly brought to a crawl because they dropped Netscape 5’s code. 5. Microsoft had windows update to help benefit the updates and such. Subjectively speaking, based on the features that were offered on both browsers, I believe that IE4 offered superior performance and features in comparison to Netscape. Though i’m sure this was mostly due to the system integration. Do some research about MS v Netscape !! You hit the nail right on the head with your comment “this was mostly due to the system integration”. Everybody always seems to have it backwards, except you. Don’t reply, can’t be arsed arguing. Uh… how is making internet explorer more integrated with windows causing Netscape to be incompatible? Last I checked netscape still ran just fine with IE4 installed. I know because I ran both browsers for a while back in the day. You do understand that “incompatible” means that Netscape just wouldn’t work right? When I said “mostly due to the system integration” that was in-context stating that IE had a benefit over netscape. Not sure how you translated that as “therefore Netscape wouldn’t work in windows”.